Currently Carey resides in Hartford, Connecticut, and teaches at the Hartford Art School. She holds a B.F.A. from the Kansas City Art Institute, Missouri, and an M.F.A. from State University of New York at Buffalo. 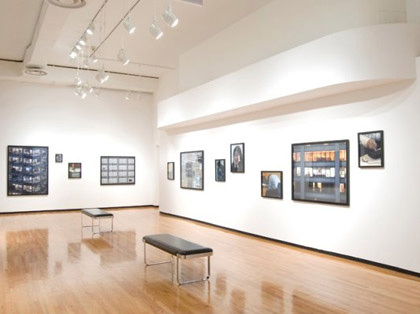 Her photographs have been exhibited at numerous galleries and museums, including Photography Degree Zero, New Haven, Connecticut; Real Art Ways, Hartford, Connecticut; Paesaggio Gallery, West Hartford, Connecticut; Maresca Gallery, New York; Cleveland Center for Contemporary Art; The John Good Gallery, New York; the International Center for Photography, New York; University Art Museum of New Mexico, Albuquerque; the Concord Gallery, New York; and the Fogg Art Museum at Harvard University, Cambridge, Massachusetts. She has received many grants from her home state of Connecticut as well as the Massachusetts Council of the Arts, New Works Grant, New York State Federation for Artists Grant; and a National Endowment for the Arts Award. Her photographs are in the permanent collections of The Art Institute of Chicago; the Baltimore Museum of Art; Brooklyn Museum of Arts; Chase Manhattan Bank; Coca Cola Corporation; Fogg Art Museum; George Eastman House; International Center for Photography; and the Los Angeles County Museum of Art, among others.